And the answer is that I’m not always motivated. Hell, I’m not even usually motivated! The biggest contributing factor to my success in both health and fitness, it is not motivation. It’s discipline, and habits. In today’s blog post, I will be showing you step-by-step how I personally plan my New Year’s resolutions (and any big goals really – this is applicable at any moment!) that I set for myself. I will then show you how I break those large goals down into a plan of attack: month by month, week by week, Day by day, and most importantly– Habit by habit! Now, we are a vegan health and fitness blog. But I think it’s important to remember that health and fitness, training and nutrition, are not our entire lives. 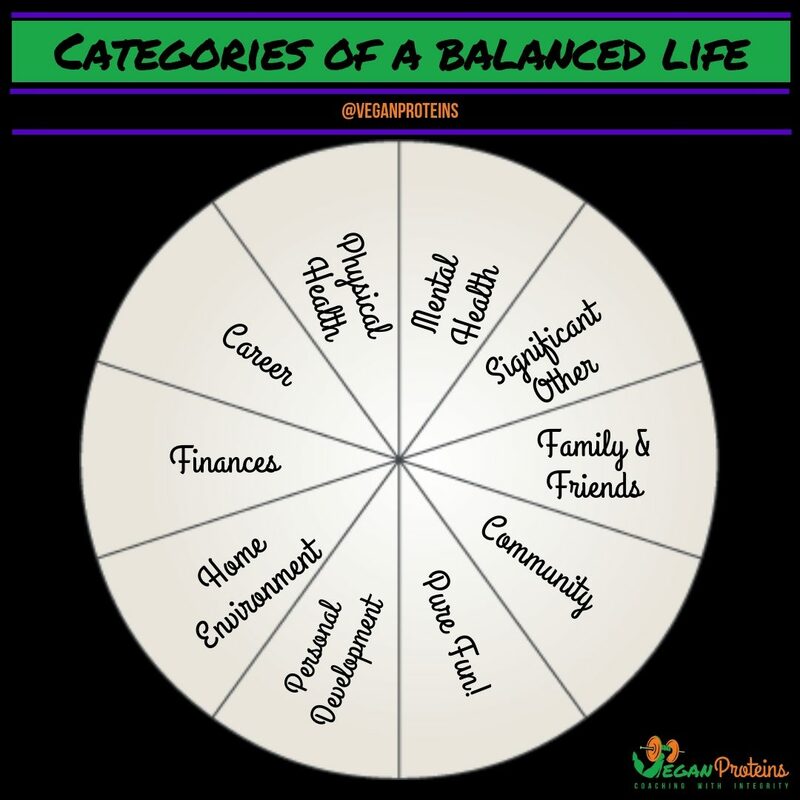 There are many areas in which we must invest equal amount of effort, or we will end up living an unbalanced life. Anytime we put a disproportionate amount of effort into our training and our nutrition, something else in our life will have to give. And likewise, if we over-commit to our training in nutrition, we won’t be able to keep up with it, and we will eventually quit completely. Better to start it with a good balanced plan, and improve upon areas where we need to, then then to put all of our vegan eggs in one basket, and have to quit. Once you have your categories, think about what you would like to achieve each one within the time frame you’re working with. Trying to make your goals big, but realistic. 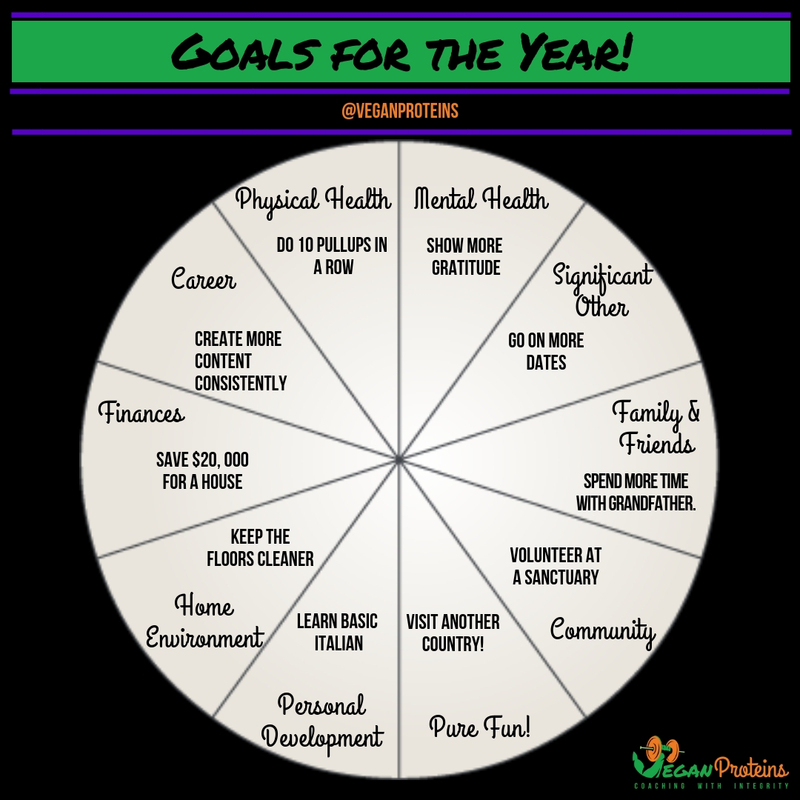 It’s okay to have more than one goal per category, but I do recommend that you had at least one goal per category of your life, even if that goal is simply to continue with your good habits. ….and others are really going to need to be tackled daily, such as showing more gratitude. 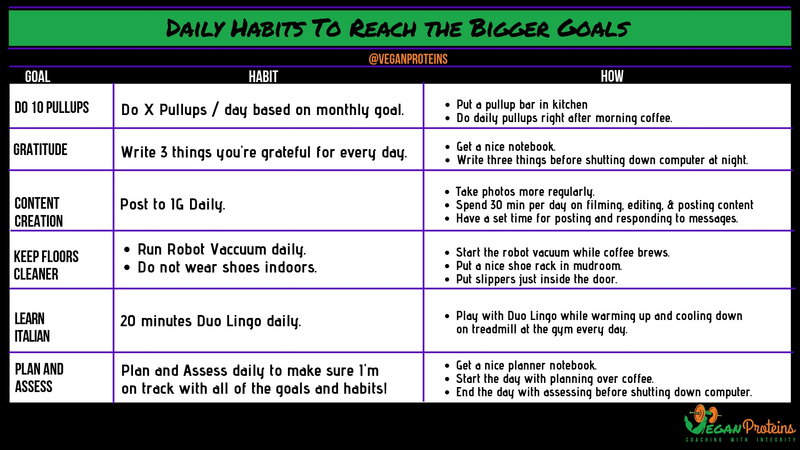 In this next chart, I show you the daily habits needed and, more importantly, HOW I plan to implement them. 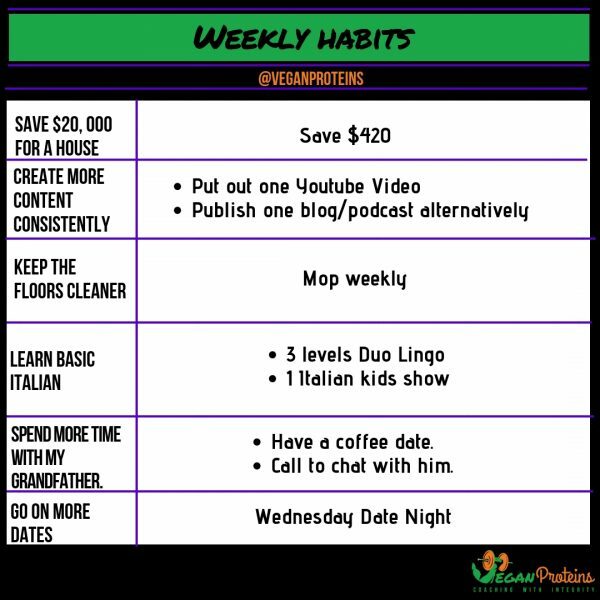 It’s not enough to know what the habits need to be. It’s important that you know when and where you’re going to perform the habit. If you can pair it with something you already do, like having morning coffee or warming up at the gym, even better. You can see at the bottom of this chart, I have put maybe the most important habit of all: assessing and planning regularly. If you don’t stare your goals in the face regularly, it is VERY easy to forget about them. So by planning and assessing, we keep everything fresh in our minds. At the beginning of the year, in my year-long planner, I plug my monthly goals in first and my weekly goals second. 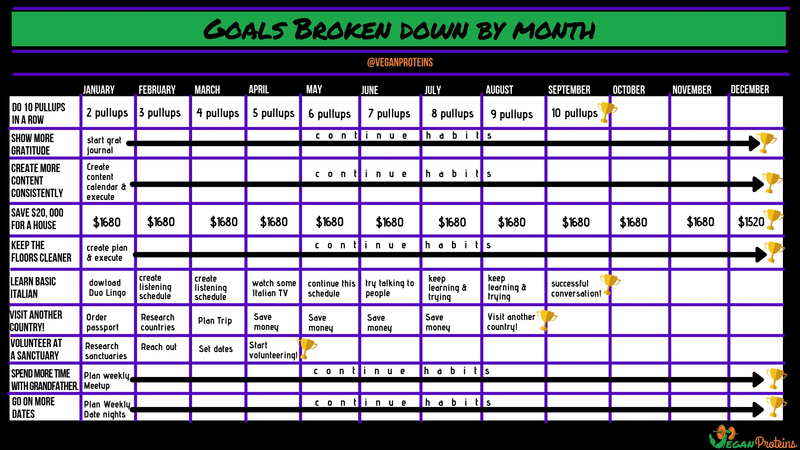 I tend to write in my daily goals as I go and re-write weekly and monthly goals as I need to. This keeps my big goals, in manageable, bite size pieces that are tackle-able (is that a word?!) and not overwhelming. Now that I have shared with you all some of my resolutions and goals and how I go about achieving them, I would LOVE to hear from you! How do you plan your goals, how do you attack them? Please share with me because I love to learn from others as well!